Delightfully unique petal design adds flair. Absolutely entrancing, the markings on ‘Tiger Eye’ viola are unlike any other we have seen. Like petals painted upon petals, the design is delightfully unique. The mix of yellow and red provide a perfect autumn color display. A fun addition to decorative containers! Viola may be grown from seed sown early indoors and transplanted outside after frost or planted as a potted plant. Sow indoors 8-12 weeks before the last heavy frost using a seed starting kit. Violas can take a light frost. Direct sow in full sun to part shade in well-drained soil in fall in the South. 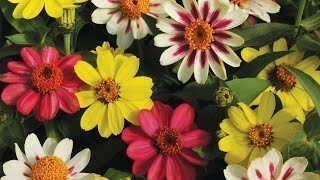 Sow thinly and evenly and cover with ¼ inch of fine soil. Seedlings emerge in 7-14 days depending on the soil and weather conditions. Select a location in full sun to part shade with well-drained soil. Dig a hole for each plant, approximately 12-14 inches apart large enough to amply accommodate the root ball. Violas can be cut back in midsummer as they get scraggly, which encourages new growth and re-blooming when cool temperatures return in the fall. Add violas to mixed plantings with low-growing perennials. They are pretty groundcovers, excellent under deciduous trees, and can be used alone or with other plants such as common periwinkle. Use violas anywhere you need an extra touch of color in spring-among other edging plants, with spring bulbs, in containers, and mixed beds and borders. Flowers are edible and can be added to salads or used to garnish plates. Viola, Tiger Eye Mix Hybrid is rated 5.0 out of 5 by 1. Rated 5 out of 5 by KorrineNicole117 from Lived through Erie pa winter !!!! U planted last fall they lived through the winter and even kept flowering throughout the harsh cold temperatures.